How beautiful that is to look at our students and see not only their progress but also our own. 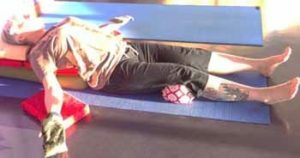 It is a gift to notice how they have responded to our words and learn how skilled we are at helping them to find relaxation in the asana through correct alignment and personal modifications. Some people are auditory learners and some are visual learners. If we want to reach everyone in the class, then demonstrate new or major poses along with verbal cues and instructions. If you like to teach vinyasas, demonstrate the flow first, then guide students through it verbally. Arthritis is inflammation of the synovial joints of the body and is one of the most common of all disabling diseases, afflicting 1/10 people. Arthritis is a crippling degenerative process which can eventuate in irreversible destruction of the joint. The condition is characterized by pain, swelling, redness, heat and loss of function in one or more joints. Those most often affected are the large, weight-bearing joints (hips, knees and ankles) and the small joints responsible for repeated, finely articulated movement, such as the fingers. In the science of yoga arthritis is not considered t o be a disease in itself, but rather one symptom of a widespread metabolic and pranic malfunction which begins early in a person’s life. Yoga offers a way to arrest this progress. In fact, in the early stages, before irreversible damage to the joints has occurred, a complete reversal is often possible. In the later stages, yogic practices can reduce drug dependency, maximize remaining mobility & function in joints and make one’s life more tolerable and acceptable. Viparita Dandasana is a very restorative asanas for arthritis. You will need some props for this restorative pose. Place a foam block at top of the rectangular bolster, and a folded blanket on top the block (where the head will rest). Place another folded blanket below that (to rest thoracic spine). Angle the two foam blocks to either side of bolster on the mat (to rest your forearm and hands on). 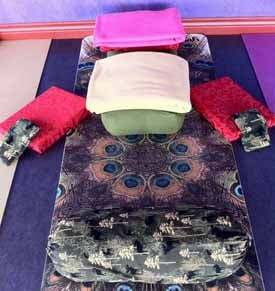 Sit in front of this setup & place the cylinder bolster under knees. Recline back & enjoy pose. Add eye pillows to rest in palms. Place another eye pillow over the eyes. You may remain in the pose for up to 15 minutes. Enjoy! Benefits: Improves breathing & circulation throughout the body. Relieves tension. Pose can be used during pregnancy.